The Children of Theatre Street. 1977. DVD. A documentary on the Kirov School of Ballet in Russia, narrated by Princess Grace of Monaco. "Talent is considered worth measuring only when it occurs in the right body," the narrator announces as hundreds of children are paraded across the camera. Each child is aged 10-12 and is gleaned from an application pool of thousands, all hoping to be chosen by the illustrious Vaganova Choreographic Institute and Kirov Ballet. The audition process as we see it is incredibly is rigorous, with children measured and chosen for the specific physical proportions deemed necessary for the ballet before even having a chance to show off their ability but, as this movie keenly illustrates, the audition is only the first step that they'll take in a lifetime of rigorous discipline if they are accepted. Director: Earle Mack, Robert Dornhelm. Cast: Elena Vorontsova, Galina Mezentseva, Konstantin Zaklinsky (Kirov Theater, Russia), Princess Grace Kelly (Monaco). Teachers and students of the Choreographic School. A. Y. Vaganova (Academy of Russian Ballet), St. Petersburg. 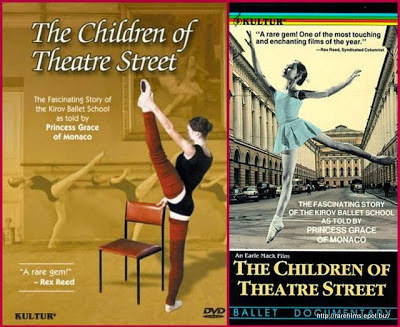 Download The Children of Theatre Street. DVD.